Aldi likes to release a bunch of products all related to the traditional flavors of one area of the world. In the past we've seen them visit Greece, Italy, Mexico and Germany, but right now their latest collection is inspired by the flavors of India. For today's #MeatlessMonday post, I heated up one of Aldi's frozen vegetarian curry meals for my boyfriend and I. It has something called "vegetarian strips" in it, which look suspiciously like tofu, so we'll see how this one pans out. We've got some appealing art and yummy food imagery, and the instructions are easy to read. There's really nothing to nit-pick about here. I mean, it looks like a frozen product you'd buy anywhere else, like Trader Joe's, or even Target. My boyfriend, who usually picks on my Aldi obsession, saw the bag and didn't think it was from Aldi at all. Aldi's house brands are stepping things up, and I love it! The instructions are as easy as they come. 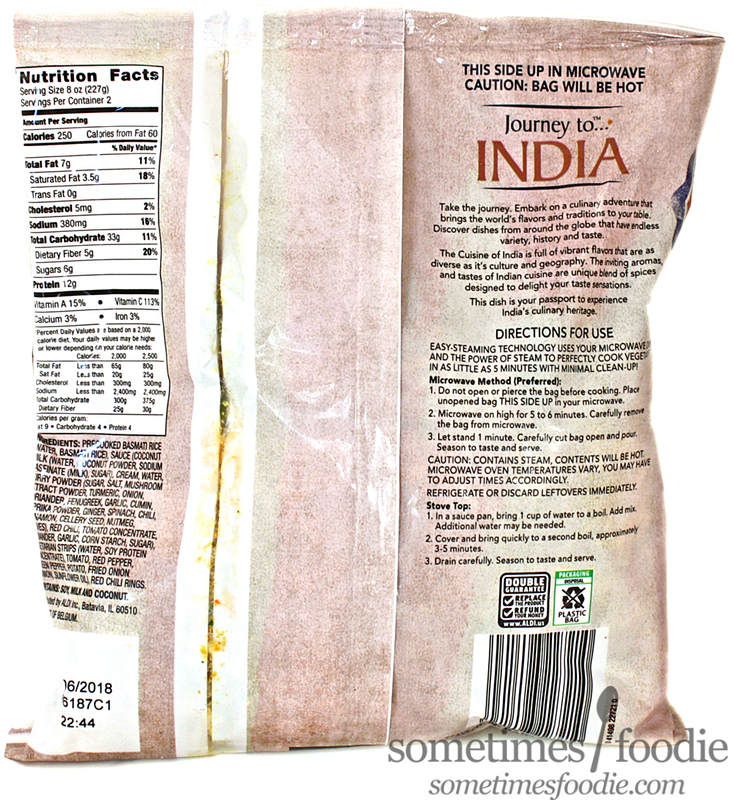 Place bag seam-side up in the microwave for 5-6 minutes. I did that, but found after 6 minutes the contents in the center were still ice cold. The microwave I was using was a little old, so that was likely the issue. I mixed up the contents of the bag with my hands a bit, separated it into two bowls, and microwaved them for another 2 and a half minutes, and everything was nice and hot. The vegetarian strips did NOT look appetizing in my opinion, but Tofu strips are a bit of a hard sell. Once everything was heated properly, the kitchen smelled like coconut milk, which was pleasant enough, but I took it as a bad sign. We're more of a spicy curry crowd, and this is looking and smelling pretty mild to me. I took a big bite with the vegetarian strips in it, and the flavoring was just as I expected. Coconut-heavy and mild. The strips are definitely tofu, and they may look like chicken, but they have all the texture of a kitchen sponge. I'm picking on it, but it's not bad. 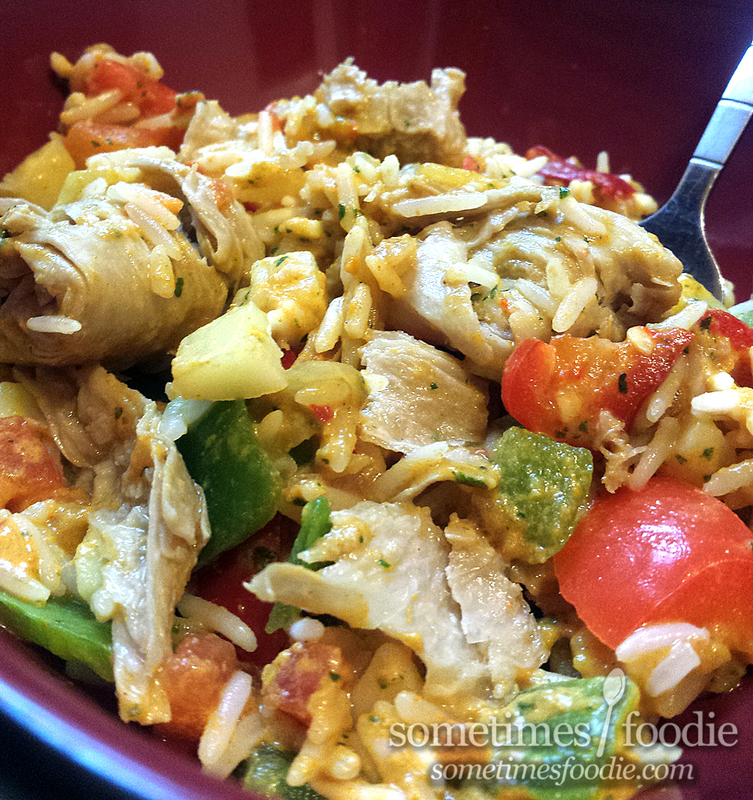 The veggies are refreshing, the rice has decent texture, and the sauce is coconut-y. 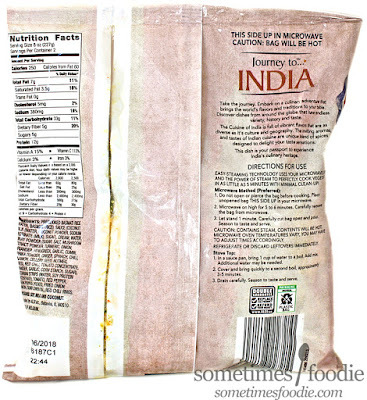 It's a nice mild freezer meal for people who want to feel like their eating adventurously, while still playing it safe. I personally wouldn't buy it again, since we're more of a spicy brown-curry kind of family, but if you're into more mild and refreshing dishes, this could be perfect for you. Hi Maria! I don't know if this is appropriate to comment here but...what's going on with Candyology101? I just realized it hasn't been in my podcast feed in over a month. Went to Candyblog and it hasn't been updated in several months. I just wanted to check because it's one of my favorite podcasts and I'm sad not to have it in my life. I really hope you're all doing okay. If we can find another producer the show may be back in it's usual format, but as of right now we'll be on his other show, The Nosh Show for candy-related episodes and discussions. We'll be sure to post links when we are! Sadly, for now, Candyology101 is on hiatus until further notice. Thanks so much for the reply! I have a backlog of Nosh Show episodes so I didn't hear it yet if it was mentioned on there. The worst-case-scenario-syndrome in me started fearing something bad has happened so I'm glad you're all okay and I'll look forward to hearing you on The Nosh Show! Maria, I just tried this dish the other day. That meat-substitute was horrible. It had the consistency of shoe leather. And the fact that it was processed to look just like meat somehow actually made it seem that much worse. The rest of the dish was OK. 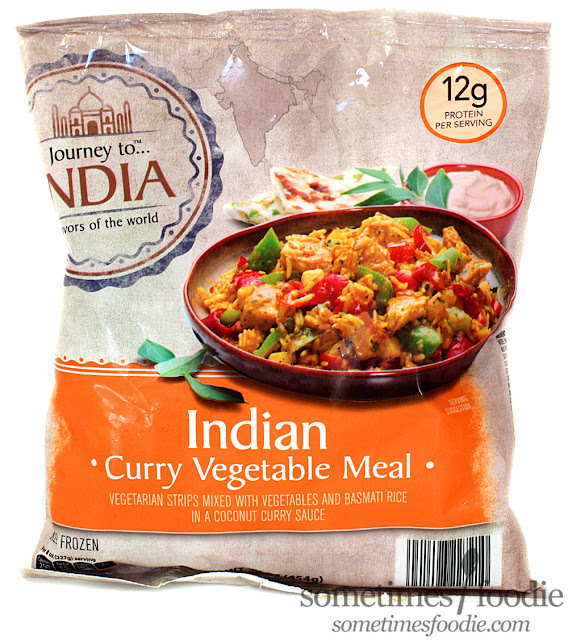 I'm not terribly impressed by the latest ALDI 'Journey to Thailand/India' curries. They all pretty much taste the same - yellow, red, and green. Too sweet, not nearly enough heat. Now the red and green curry rice noodle soup bowls were pretty darn good. It's nice to see that most of these recent Thai dishes are actually imported from Thailand (the last batch of Thai curries a month or so ago were made in Germany, of all places). I've noticed that! A lot of their Asian inspired products are being made in Europe, so I doubt their authenticity, and they all lean more towards the sweet and mild side of things.